I was looking at a photo of the tornado damage in Vilonia, Arkansas. Two lines of homes. One largely intact. Garage doors mangled, but standing. Across the street, the homes completely flattened. No matter how well you prep, you’ll always face chance or luck. The people with the fully intact homes were lucky. Across the street, not as lucky. Many residents were able to find safety in community shelters. In a tornado you should seek the lowest shelter you can find. If you’re on the side of a road, find a ditch. In a building, move to the basement level. If you don’t have a basement, know where the closest shelters to your home are. If you live in a tornado prone area, you should have a basement. When tornado strength winds hit, they can level a home. They pass right over basements. You basement is your go-to shelter. I wrote extensively about basements in the book and this post is a summary of parts of that. What should a prepper’s basement look like? If a lot of debris (i.e., the rest of your home and the neighbor’s home too!) falls on top of your basement, it should remain structurally intact. It shouldn’t collapse. Basements are held up by beams and posts. Inspect your posts or columns. Posts run vertically and hold up large beams. Look for signs of rot on the lower part of the posts. Rot is caused by chronic water damage. Rotted posts should be replaced. You can purchase metal columns which can also hold up the beams of your basement. You can add one or two of those for extra reinforcement. Inspect your beams. Beams run horizontally holding up the center of the basement. If cracked, a structural engineer can help you decide what course of action is best. They can be repaired or replaced. If your beams and posts are solid, your basement is likely very safe in a tornado or maybe even in a nuclear blast. Your house can vanish, the basement endures. Running from the exterior walls of your home to the center beams are floor joists. They’ll be a lot of them. The closer spaced the stronger. These boards hold up the floor above the basement. One end sits on the concrete block of the exterior basement wall. The other end sits on the beam. There should be bracing between the joists. Most joists should be fine. The biggest threat to them are plumbers and electricians who like to drill holes through them and run pipe or wire in the holes. Smaller holes are OK and should be drilled to code. If a floor joist has been weakened, you can sister another section of board next to it to reinforce it. Some use long bolts and sandwich the compromised joist between two long boards of the same dimension as the joist. In your basement, the safest spot is usually a corner. If a semi truck lands on top of your home, even if everything else gives way, there’s a chance the concrete blocks of a corner will hold up some of the floor above it. You have a pocket of safety. With the structure now strong, inspect your basement windows. Blowing glass is a threat. If you have older non-safety glass windows, you could replace them. Another option would be to fabricate some sort of wooden cover over the windows that threaten your go-to corner. Following these simple steps will help assure a structurally sound and safe basement shelter from a storm. 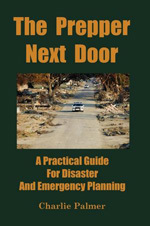 Charlie Palmer, author – The Prepper Next Door: A Practical Guide For Disaster And Emergency Planning. This post is a comment on two things. Page 25 of Jim Cobb’s new book, The Prepper’s Complete Book of Disaster Readiness writes about Peace of mind and prepping. One reason to prep is to gain peace of mind. You are prepared for whatever the future holds. I’ve heard this theme from several preppers. The second thing I’m commenting on is this post: Are You Addicted To Prepping? The best way to have peace of mind is to be ignorant of dangers. A child raised in a loving and supportive environment has few fears. If you’re unaware of a danger, it doesn’t scare you. Go play with the lions. You will get eaten, but you’ll have peace of mind right up until the lion’s lunch. This is the parent’s dilemma: How do you make your child aware of life’s risks without inducing fear in them? You can only keep them out of the lion’s cage for so long. As you age, you gain a more accurate picture of how dangerous the world is. I’ve written about this before. It’s not intellectual knowledge. It’s visceral, gut level understanding. Tell a friend he should add a deadbolt lock to his door. He intellectually agrees. He doesn’t do it. Talk about reinforcing the door jamb with steel and his eyes glaze over. He becomes interested in home security only when he’s burglarized. He appreciates the threat in a whole new way. Most preppers will never have full peace of mind. Preppers are too aware of threats and dangers. A prepper always knows there’s something he’s not prepared for. Once aware of a threat, people can develop peace of mind with a false sense of security. A kid studying karate and not competing in real contact events is a good example. He’s taken lessons. He’s a tough guy. He can defend himself, until he’s in a real fight. There’s nothing wrong with a peace of mind based on deception. The value of peace of mind in daily life can’t be underestimated. You won’t be prepared though. The thing that really messes with peace of mind is becoming immediately aware that you face death. Not like in fifty years, but like in the next 15 seconds. That messes with a person’s mind. If you can come to terms with that, you can acquire a different kind of peace of mind. Not as peaceful, but workable. Preppers prepare because they’re aware of bad scenarios. They want the peace of mind of knowing they’ve taken reasonable steps to be prepared. The best preppers don’t want a false sense of security, but a peace of mind based on honestly confronting reality. Preppers prepare because it’s part of who they are. It’s official. America is no longer a democracy, a republic, or a representative government. We’re an oligarchy. Examining 1,800 policy changes, the will of the American people made little difference in determining policy. What mattered: The interests of the super rich and the special interest lobbying groups. They get what they want. When the interests of the special interests coincided with the will of citizens, citizens believe their government is responsive to their wishes. It’s just coincidence. Citizens get what they want just often enough to keep them believing they actually matter and have a voice in government. Lesson: It doesn’t matter what people call something. What matters is how it works. Many governments today are essentially operating oligarchies with a façade of public participation. Here’s a good example of how big business works over the little guy. If you install solar panels in Oklahoma and offer your energy to the energy companies, you’ll now be charged an extra fee for not using energy from the energy companies. Lesson: if you go with solar or wind you need batteries to save energy for your own use. Always remember: “Safety, as you know, is paramount.” Situational awareness is good too. A great post on Apartment Prepper. Downsize before you have to. Looking for adventure. How about extreme caving? The question: Will you do whatever’s necessary to protect your family and loved ones during a WROL? Heinz’s wife was dying from a particular type of cancer. Doctors said a new drug might save her. The drug had been discovered by a local chemist and the Heinz tried desperately to buy some, but the chemist was charging ten times the money it cost to make the drug and this was much more than the Heinz could afford. Heinz could only raise half the money, even after help from family and friends. He explained to the chemist that his wife was dying and asked if he could have the drug cheaper or pay the rest of the money later. The chemist refused saying that he had discovered the drug and was going to make money from it. The husband was desperate to save his wife, so later that night he broke into the chemist’s and stole the drug. The question: Did Heinz do the right thing? Would you have stolen the drug to save your wife? In a long-term WROL, would you take supplies from others if it were the only way left to save your own family? If you watch David Nash on Youtube, you know he’s a smart man with a ton of prepping experience. His new book 52 Prepper Projects: A Project a Week to Help You Prepare for the Unpredictable has a great assortment of do-it-yourself projects to learn self sufficiency. The book has great photos to demonstrate each project. Each project is clearly explained. Think of the book as a smorgasbord. Pick and choose the projects you want. As David says at the end of the book, it’s not about the specific projects, it’s about learning to become self sufficient. It’s about the journey. Over the years, I’ve done some of these projects in various forms with varying degrees of success and can say those work. I’m familiar with the concept behind others. Even with over 30 years of prepping experience, there are many projects that are new to me. A few of the projects I’ve done, but didn’t really like. Pemmican, icky, yucky, poo. I know it was the staple of the American Indian and Frontiersman, and I’d certainly make and eat it to survive in the wild if need be, as it’s a crucial way to preserve fat. Might I recommend his project of making Sourdough Bread instead? If you want to go all Bradford Angier, you can bake bread on a stick. The projects are all something a suburban prepper can do. Most projects can be done by an urban prepper. I’ve wondered about Bees myself in the city. Would that be a no-go? What if they stung a neighbor? One of the projects isn’t super prepper practical, making a high pressure steam to weedeater engine conversion system, but it’s way cool and a neat learning experience. David warns us not to blow ourselves up. I’ll need to confront the cheese before tackling that one. 52 Prepper Projects: A Project a Week to Help You Prepare for the Unpredictable gets my highest recommendation. Buy it. Add it to your prepper library.